Save money utilizing your freezer, and learn how to keep foods at their best. I didn't know that you could freeze eggs....did you? I am going to bookmark this info so that I have it the next time I want to freeze extra cheese and milk! Since her crockpot is much larger than mine, I am getting all excited about the yummy possibilities that I can now create. I found this recipe over at allyou.com and I can't wait to try it! What yummy dishes have you created or come up with to use in your crockpot? I'm always looking for new ideas! Did NOT know that about the frozen foods! Good to know! 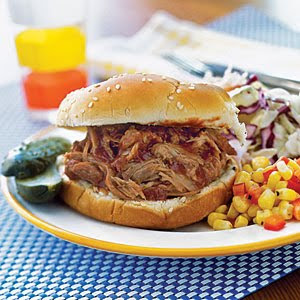 That pulled pork looks awesome! Gives me an idea for Monday lunch! Another thing that tastes good in the crockpot but is a bit unusual. Put in some pork chops and dump a can of canned cherry pie filling. Or if you prefer, a can of canned apple pie filling. Then put it on low all day. Works best if there are a couple layers of pork chops in the crock pot. I had no idea about the eggs! I also did not know about the eggs! A hint with freezing cheese(the hard type cheese like mozzarella, cheddar, jack cheese, etc.) If the recipes you will eventually use it in calls for shredding, it's best to shred BEFORE freezing. Blocks of cheese will crumble and tend to fall apart when thawed so if you need it looking 'nice' pre-slice or shred before freezing. And tho cream cheese does freeze when thawed it has a grainy, strange texture if eaten straight(like on a bagel, etc. )and not put into a dish, so keep that in mind.